As I write this, I am reliably informed that it is National Biscuit Day. Well, enough said, we don’t need any encouragement in this office to stock the coffers with biscuits! Mind you, I could certainly do without any encouragement along those lines as my bathroom scales are very quick to inform me. I do therefore have to admire the efforts of at least a couple of our CSS tenants who are looking a lot slimmer of late, and also are noticeably quicker on their feet. So a big well done to all you slimmers out there who are showing us all how it is done (or indeed who are struggling to harness that elusive willpower in order to swerve the biscuit round). I could certainly use some tips on that one. So, what has been happening in and around Care services over the past few weeks? On the care accommodation side we have had a few CQC inspections. Rosemary Cottage did fantastically well to hold on to their “outstanding” rating in the Caring category, Homelands and Old School House also achieved a “good” overall result. Currently we are still awaiting reports from more recent inspections at Holly and Ivy Cottages. Old School House have also welcomed new resident Chris Keogh. 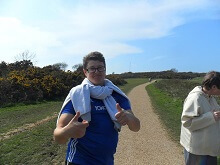 Chris has been accessing our Life Skills services for quite some time and everyone was pleased to see that he was successful with his funding application for a residential placement and it is fantastic to see how quickly he has settled in to his new home. I understand that it shouldn’t be too long now until the Beaver Lodge extension is finished too. It will be exciting to see who will benefit from this prime opportunity for supported living placements with the Trust. In terms of Life Skills services, there always seems to be so much going on. Poulton Wood Bluebell Cream Tea was a notable success, as was the woodlands open day. Art at the Farm installed their new exhibition over at the Beaney House of Art & Knowledge in Canterbury in May, and several services attended the Wealden Fair recently, so it is a veritable hive of industry out there. Although it is still early days, 2018 is already proving to be a busy year for building work, with extensions also in progress at both 1 Warren Mews in New Romney and Beaver Lodge in Ashford, both of which will result in extra supported living places becoming available in due course. Our grateful thanks must go to all the Beaver Lodge tenants who very kindly agreed to temporarily relocate to the old Harrington Cottage while the messiest and noisiest parts of the extension works were effected. I am sure, though, that they are more than pleased to be back home again now. Work is also under way planning for our Care Open day in June. This year we are collaborating with students from the Norton Knatchbull school who, as part of their work experience programme, are lending a hand with making arrangements for both the day itself and setting out ideas for design of marketing materials to be used on the day and beyond. The students are immersed in every stage of design, negotiation with printers, and ultimate production of an updated display board and information packs that will be used regularly by the care team. Initial work has proved to be rather promising, so we are looking forward to it all contributing to what we hope will be another successful event in the Summer. It’s great to be working with the four students who have joined the first Pathfinders – Employability Life Skills Programme. We have been working hard to identify our individual strengths, character and personal interests and exploring the job or volunteering roles to which we are most suited. We have been writing our own CV’s and have just begun to use the Internet to research local businesses and explore how to look for work online. We have been working with Ashford College who are delivering a 5 day ITQ – Level 1 course to help us improve our digital skills to help us look for and apply for work online, write CV’s and covering letters. Pathfinders are planning a trip out as a group to visit some local businesses that match our interests. Some students have re-activated some dormant skills - Becky has begun to spin wool from local Romney Marsh sheep and is preparing to create and sell some hand woven rugs. 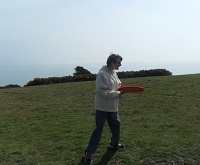 Lisa is enjoying being a voluntary dog walker for a lovely dog called “Toffee” and John is in the process of becoming a Conservation Volunteer at Samphire Hoe. I have been horse riding at Grove Farm, and I really enjoyed it. I have been riding a lovely brown horse called “Mama”. I haven’t been horse riding in a while but I did remember everything that I have previously learnt. I have been on holiday with my dad and we went to France. We got there by ferry, which was really exciting. I have been enjoying the sunshine, having loads of days out. 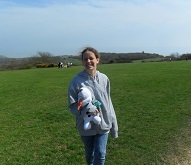 I went to Hastings Country Park, I enjoyed a lovely picnic and played loads of games like giant badminton and frisbee. 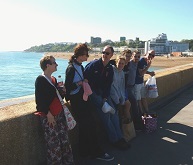 I went to Folkestone harbour arm and watched some live music, which I loved. My name is Gracie Croft I am now living at Old School House. I have made lots of new friends and have become more independent, which I am really happy with. I have been on lots of exciting trips out, like going to the zoo, shopping trips (I can shop till I drop), having picnics and trips to the beach. Last time I went to the beach I got buried in the stones; this was great fun. I had a trip out with my friend Charles and did some shopping. I had a great time and laughed a lot. I went to Festability and they had loads of live music. 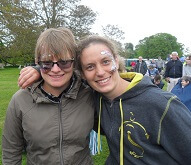 I absolutely loved this day out, I got my face painted and danced my socks off. I had lots of fun with my friends and staff and couldn’t stop laughing all day. Hi, my name is Chris Keogh and I have recently moved into Old School House. I love living here as I am learning something new every day. I have just started to do football on a Wednesday with 5 a side fun. I am really enjoying this as football is my passion and I’m a huge Chelsea fan. I am now able to go to new Romney high street independently, as I have done my travel training. I am very pleased with myself. We have had a busy few months here at Old School House. We have filled our 2 vacancies and welcomed Grace and Chris to join our busy fun house! They have both settled in very well. There have been some swapping of life skills for some: Charles has been doing horse riding at Grove Farm in Iden and will be doing this on a regular basis. Daniel has enrolled in City and Guilds and is now working within a different group on the farm. On 12th May we all went to a music festival called ‘Festability’. We did this to celebrate 25 years that Old School House has been open. The festival was at Quex park, it was a fantastic day with loads of live music and stalls, all set in a safe environment. Check out www.festability.co.uk to see what they are all about. We will definitely be going next year if they repeat it and would highly recommend others to go. It was a little wet at the end of the day but it didn’t spoil the fun. We would like to say a big “thank you” to Scavengers car club who donated £300 to our funds, which covered the cost. Also a big thank you to Andy who kindly drove the mini bus filled with folding chairs, packed lunches and some very excited staff and residents. Here are some pictures from our fantastic day out! We enjoyed the afternoon at the Poulton Woods Cream Tea. 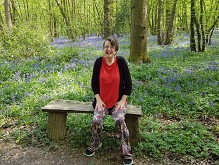 What a gorgeous sunny day it was and the Blue Bells were in full bloom. Thank you to Lyn and all who helped to organise such a wonderful day for us to enjoy. We want to say Thank you to The Friends of COT for their very kind donation towards our summer activities this year and to Mrs Richards (Ricky’s Nan) for sending a kind and generous donation towards a treat for our holiday to Butlins in July. We are all looking forward to our holiday. 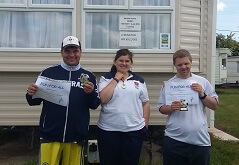 We are all working with our keyworkers to plan days out over the summer months and hoping for some warm sunny days. We are all going together on The Kingfisher Boat trip in July and September, which we all enjoy every year. 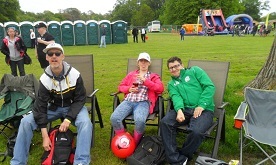 Some of us went on a football weekend in May to Marlie Farm, which was organised by Margot. We all had a fun weekend. Thank you to Margot and Mike for organising the weekend for us to enjoy. Last but definitely not least congratulations to Ellie and Phil on the birth of their beautiful baby girl Ophelia Primrose, who was born on the 13th May. On Saturday 21st April I attended - along with friends and family, including Tamsyn, Stephen, Sadie, Karen and Peter - a wedding. My niece Hannah Young-Browne married Simon Charles Weaver at Staple Parish Church, near Canterbury in Kent. 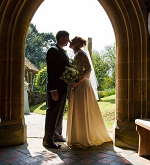 Afterwards they enjoyed a ride in a stunning white car used for the bride and groom, which took them to Littlebourne Barn. The happy couple then jetted off on their honeymoon to the Caribbean for a sunny 2 weeks. On the 28th March I won the first prize raffle, with ticket number 452, at my local GP surgery. In the large basket of prizes I won 10 chocolate bunnies, a large Celebrations Easter egg, three small bottles of port, a lamb chocolate lolly, two boxes of chocolate truffles and a Peter Rabbit keepsake egg. I gave one of the bunnies to Karen, my friend, for Easter. I gave my sister in law a bottle of port and I shared some of the truffle chocolates to staff. On Tuesday 27 March 2018 at Poulton Wood, Nick Reed and Nick Sanderson did a guided tour of the woods as part of their education towards their City & Guilds certificates. The two Nicks pointed out various features of the wood as the walk progressed, such as the wild bees that lived in a high hole in a tree trunk and the identity of a number of trees and plants. A squirrel running up a tree prompted a discussion on how squirrels build nests rather like birds do, though these are called dreys when they are the work of squirrels.